Last Minute Strategy to Win the Gold! You're in the playoffs, but your team has been decimated by injuries and rest days for your stars. ASL's Willard Simms has some solutions! So you’ve made it! Congratulations on being in the running for the Fantasy Championship Round Trophies - but there’s a catch! The lineup that successfully got you into the playoffs has been decimated by injuries and also NBA Coaches managing rest days for some of your star players. What do you do now? There’s only one solution, you need to be researching the players getting lots of playing time now and taking advantage of it! Here is my list of 5 players who will be seeing extra minutes in the last games of the regular season, right up until through the final week. The Miami Heat are fighting to lock up the last playoff spot in the NBA’s Eastern Division. And to do that they’re calling on a great name from their Championship past – Dwyane Wade. In his last 5 games the future Hall of Famer has scored 92 points, while shooting 3 pointers at close to 50 percent, getting 7 steals, averaging over 5 rebounds a game, and hitting better than 45% of his field goals. Wade has always been great in the clutch, and I expect him to be so motivated getting the Heat into the playoffs in this, his last season, that his numbers will only get better. In his last 4 games, Tyler Dorsey of the Memphis Grizzlies has scored 66 points, while handing out 17 assists, hitting 10 three pointers, and averaging over 7 rebounds a game. Mike Conley is banged up and the Grizzlies are resting him over the final few games. When he rests, Dorsey gets most of the playing time at the point guard position, and even when Conley is in the lineup Dorsey often plays next to him. He’s still on many waiver wires, so scoop him up if you can get him! Miles Bridges of the Charlotte Hornets is averaging 14.3 points a game (on 60 percent shooting), while grabbing 7.5 rebounds, almost 3 assists a game, 2 steals, and 2 three pointers. He’s getting lots of playing time because of injuries to so many Hornet players, and also because he was a lottery pick in last season’s NBA draft, and seems to have now finally figured out how to play in the NBA. Grab him! Seth Curry of the Portland Trailblazers is the lesser known of the Curry brothers, but he’s now beginning to make a name for himself! With the injuries to C. J. McCollum and Jusuf Nurkic, Curry has become one of the “go to players” for the Blazers. With the great Damian Lillard demanding most of the opposition’s attention, Seth Curry now has room to get off the deadly 3 point shooting that seems to run in the family. In his last 4 games, he’s hit 12 triples, while sinking them at a 50% clip. And in those 4 games, he’s hit the 20 point mark 3 times. Another player who’s gotten a big boost in playing time for the banged up Portland Trailblazer’s is Zach Collins, who’s been selected to fill in for the out-for-the-season Jusuf Nurkic. 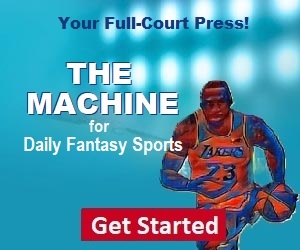 Collins has an all around fantasy-friendly game, and is really taking advantage of his extra minutes. If you extend his limited playing numbers to a full game average (which he’s now playing), he’s getting 13.2 points, 8.6 rebounds, 1.9 assists, 1.0 treys, and 1.7 blocks. Since Nurkic isn’t coming back, you can rely on Collins to be putting in heavy minutes for the final games of the season.